Traders work on the floor of the New York Stock Exchange Sept. 11, 2015. As worries over China’s slowing economy recede, financial markets are shifting their attention once again to U.S. monetary policy - specifically, the timing of the central bank's next interest rate hike. The U.S. Federal Reserve, also called the "Fed," has kept short term interest rates at record lows since 2008 to reduce the cost of borrowing, boost spending and bolster economic growth. Central banks use interest rates as a tool to stimulate the economy when it is sluggish or cool economic activity when inflation rises too sharply. The last time the Fed raised interest rates was in 2006. 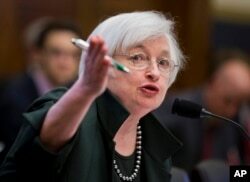 Federal Reserve Chair Janet Yellen testifies before the House Financial Services Committee hearing on monetary policy and the state of the economy, on Capitol Hill in Washington, July 15, 2015. Fed officials signaled their intention to raise interest rates earlier this year, believing the economy would no longer require ultra-low interest rates by the time the U.S. recovery took hold in the second half of 2015. Annualized gross domestic output in the second quarter was better than expected at 3.7 percent and U.S. unemployment is now at a seven-and-a-half year low at 5.1 percent. Until the recent stock turmoil in China, many experts expected a rate hike in September. But renewed uncertainty about the impact of slower growth around the world has muddied the waters. Joseph Minarik, director of research at the non-partisan Committee for Economic Development, said raising interest rates too soon could discourage demand for major purchases. And with inflation running well below the Fed’s target rate of 2 percent, Minarik said tepid wage growth, combined with higher interest rates, could push inflation even lower, sparking a damaging downward cycle of reduced demand, low wages and lower prices, called deflation. But others say waiting too long raises the risk of stimulating the economy too much, causing a sharp increase in inflation. Joe Brusuelas, the chief economist at financial consulting firm McGladrey, said a rate hike is long overdue. He said raising rates now would give the central bank the option of cutting rates again when the next downturn comes. “The Fed needs, before this business cycle ends, to get the Federal Funds rate somewhere at or above 200 basis points (2 percent), so when the inevitable recession comes, they can have firepower,” said Brusuelas. He said a modest rate hike, perhaps a quarter of one percent in September, would send the signal that the economy has improved sufficiently to begin the process of normalizing U.S. monetary policy. But raising rates in the U.S. just as central banks in other developed economies and emerging markets in Asia are cutting theirs could lead to greater instability around the world. Christine Lagarde, head of the International Monetary Fund, urges the Federal Reserve to delay its planned rate hike until at least early 2016. The fear is that the strong dollar coupled with rising rates could prompt investors to take more money out of emerging markets and into the relative safety of U.S. treasuries and dollar denominated assets. IMF spokesman William Murray said the Federal Reserve should keep its benchmark rates at record lows until there are more tangible signs of wage price inflation in the U.S.
Economists interviewed by VOA say a rate hike in September or December is still likely. But central bank officials are staying mum for now, preferring to keep all options open. That may be the safe bet, but market strategist Maria Fiorini Ramirez said silence is not a reassuring concept for financial markets that thrive on certainty. Fiorini Ramirez said the Fed should either say, "we’re not going to do anything because of weak growth or some other reason, or just do it and say, that’s it for now!" Either way, financial experts anticipate increased market volatility in the days leading to and perhaps after the Federal Open Market Committee concludes two days of closed door meetings on September 17th.